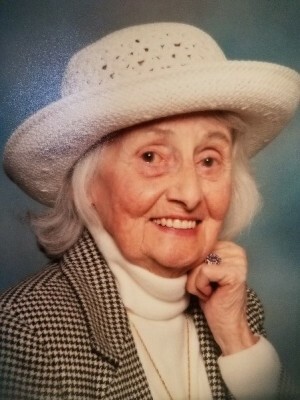 Obituary for Eileen Katherine Snyder | Allen Brothers Mortuary, Inc.
Eileen K. (Penne) Snyder, long-time resident of San Marcos CA, died Tuesday January 1, 2019 at Juehm Residential Care Home. She was born January 20, 1922 in Winner, SD; the youngest of four children to John and Birdie Penne. After graduating from Winner High School in 1940, her adventurous nature led her to Washington DC where she worked for the Department of Agriculture and then to Los Angeles to work for Goodyear Tire and Rubber Company. She married August J. Snyder on December 6, 1952 in Southgate, CA. They lived in Pierre, SD and raised four children. Longing for sunny California, they moved to San Marcos in 1973. Eileen worked for Bank of America, where she adapted her extraordinary typewriting skills to master the latest technology – the Wang word processor. She retired in 1989 and enjoyed drawing, crafting, and gardening. She is survived by three living children, Katherine, James, and William (LuAnn); daughter-in-law Vickie (Thomas); four grandchildren Bryan Camille), Eric, Justin, and Tyler; two step-grandchildren Douglas (Itzell) and Danielle; four great-grandchildren David, Kendall, Sienna, and Sophie; and nine step-great-grandchildren Aurora, Emily, Benjamin, Allison, Jacob, Larissa, Charlie, Bella and Lucas. She was preceded in death by husband August and son Thomas. A funeral Mass will be celebrated 10:00 am Tuesday February 12 at St. Mark’s Catholic Church, 1147 Discovery St., San Marcos. Burial will be at Mount Calvary Cemetery in Pierre, SD. Memorial donations may be made in Eileen’s name to St. Mark’s Catholic Church Food Pantry, 1147 Discovery St., San Marcos, CA 92078.